An earlier than planned release due to a bug discovered in the database conversion code. You can use the bug tracker to see details of the fixes by looking up the issue number as noted below, view unresolved bugs and report any you've found yourself. -Fixed: The database "convert to internal format" freezes at 0.56% with the latest GameTDB database. A simple typo caused the bug that really should've shown up before. |-Changed: Update link to WUpload has been removed from the app, replaced with a link to the WBM website. |-Added: New features for the export templates that allow creating a multiple column table. See the ncwbfsstyle template. "Entry step" = how many entries to output between the [Entry header] and [Entry footer]. |-Fixed: The database list wasn't refreshed after changing the settings. eg. Title colours etc. |-Fixed: After recent tests trying to get Direct3D working with WIn64, I accidentally got the OpenGL and Direct3D renderers mixed up. |-Fixed: Resetting the Original title colour in the settings dialog made it green instead of blue. That bug must've existed from day one. 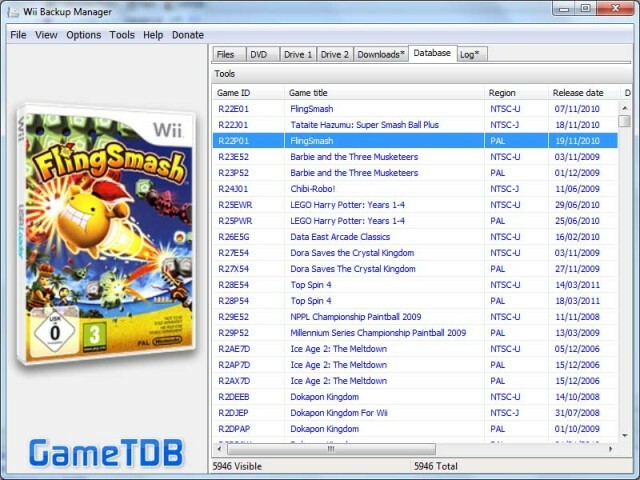 Wii Backup Manager 0.4.5 build 78 NEWEST!